Upon arrival from Iquitos Airport you will be met and transferred to the port where you will have a four hour speedboat transfer up the Amazon reaching your destination, the Tahuayo Tributary Lodges. 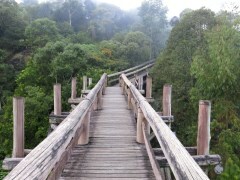 Early in the morning you will begin your journey with a hike into the Varzea forest where there is a high chance of spotting a number of different wildlife such as pygmy marmosets, owl monkeys, yellow-crowned brush tailed rats, wire-tailed manakins, barber bees, black tamarins, saddle-backed tamarins and trogons. As you continue your walk towards Lake Tapaje you will need to explore this area on a canoe where you will reach Tahuampa forest (flooded forest). At this location you will encounter the giant ficus trees, Hoatzin birds, horned screamers and the Caiman alligator from an observation platform. Following this, a motorboat will take you to Terra Firme forest where you will hike to Frog Valley where you will see beautiful little poison dart frogs. As we move onwards we will stop to feed bananas to the Woolly monkeys. As we continue our journey we will reach bat caves and for those who are braver than others they can crawl through the caves. 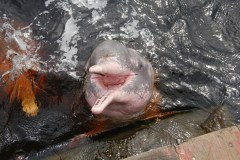 As we depart from this area we will travel by motorboat to Lake Charo where we will search for pink swimming dolphins. Coupled with the newest underwater technology you will be able to listen to pink dolphins and other aquatic animals communicate. 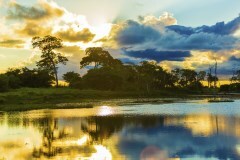 During the course of your journey you will see other unique animals such as squirrel monkeys, sloths and raptors as well as the opportunity to fish for piranahas. Lastly, we will visit a native village of El Chino where we will stop to visit the schools and farms and to learn about their culture and way of life. 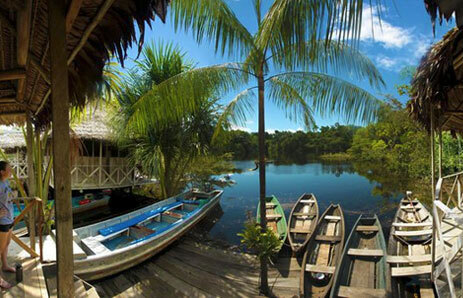 Today we will visit the Amazon Research Centre lodge where we will start the day on a boat ride to this remote area. On the way we will be able to sight bats, sloths, monkey’s, raptors and toucans. At the Research Centre there is over 100km of hiking trails which are laid out in a grid to facilitate the scientific collection of the population of animals. The trails go through several ecosystems such as the palm swamp and Terra Firme. 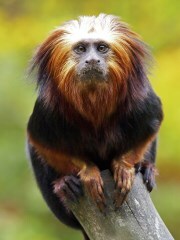 The trails allow you to see many different species of monkeys including the brown and white capuchins, saki, titi, squirrel monkey and lots more. Data collected from the camera traps around the lodge have revealed that there is a high density of jaguars lurking around the area but they are rarely seen by the guests. The research centre also allows for you to participate in various lake and river activities which provide you with the opportunity to see the highly endangered giant river otters. The following day you will embark on a full day hike to Lake Yarina to see hoatzins on their nests, blue and yellow macaws and howler monkeys. Early in the morning we will return to the main lodge for an afternoon boat ride to Iquitos where you will be transferred to the airport or hotel. Each group will get a private guide which allows the group to customise their activities to meet each group’s interests and needs. For longer itineraries you are able to add days to the main lodge and/or Research Centre. For any itinerary that is 5 days or less you are able to take out the Research Centre entirely. Tahuayo Lodge is the only lodge in the Amazon Rainforest that is certified by the Rainforest Alliance and Travel Lite for their conservation efforts in biodiversity and sustainability. The cabins are raised above the forest floor on stilts that connect to the rest of the lodge by a raised boardwalk. The high rise of these lodges above the floor means there is minimal effect on wildlife and keeps the lodges dry so you don’t experience flooding in the wet season. 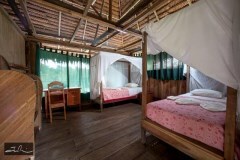 The Tahuayo lodge construction is rustic yet comfortable with 15 rooms in total. Family style cabins with one large bed and several single beds. Half of the cabins now have new private bathrooms while the other half have shared bathrooms. In addition, cabins with private bathrooms are assigned on the basis of earliest reservation.Other buildings consist of a large dining hall and areas to relax and socialize. There is some electricity provided by solar panels and batteries, so guests can recharge camera batteries or use CPAP machine. Satellite based phone, internet, and e-mail service are available. In addition to a comfortable stay at this lodge, you can stay one to three nights at in the Amazon Research Centre lodge located in remote pristine forest. The Research Centre Cabins have shared bathrooms. Expect more wildlife and better hiking trail that passes through a variety of ecosystems. 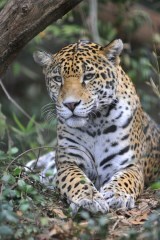 For longer itineraries, we just add days to the main lodge and/or the Research Center. Long & short pants, long & short sleeve tops, rain gear, swim suit, comfortable footwear, flip flops, high socks, sun protection, insect repellents, binoculars, flashlights, toiletries, day pack.